When he was a college student at the Rose-Hulman Institute of Technology, David Honan received a copy of the ASCE Bridges Calendar as a gift from his father. “I’ve liked bridges for a long time and he thought that would be a neat gift,” Honan said. 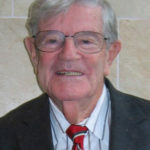 So imagine his thrill when nearly 15 years later, Honan received a new Bridges calendar that featured his photography. Honan, P.E., M.ASCE, is not only a transit project engineer for HDR Engineering in Seattle, he’s also an accomplished photographer who submitted photos to the first two ASCE Bridges Photo Contests. 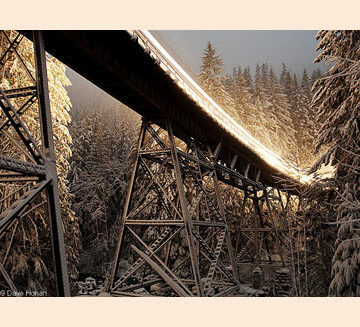 He earned Viewer’s Choice Award finalist selections both years, and his work was featured in the 2014 and 2015 editions of the Bridges Calendar. Honan was then invited by ASCE to participate on the judging panel for the 2015 contest. “Just incredibly rewarding,” Honan said. The 2016 ASCE Bridges Photo Contest is open to submissions through March 31. Judges will recognize two winners in each of seven categories: all bridges, small-town bridges, historic bridges, pedestrian bridges, high-dynamic range images, black and white images, and by ASCE Student Members. Awards include cash prizes, and like last year, all submissions are eligible for inclusion in the next ASCE Bridges Calendar. Honan talked with ASCE News about his experience as a photographer and offered some advice on taking a potential award-winner. 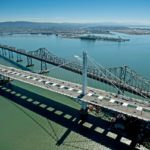 ASCE News: What do you think makes for a good bridge photo? David Honan: Lighting is certainly critical. A photo taken in the middle of the day in harsh sunlight usually exhibits flat light that is unappealing to the eye. You need something with dynamic lighting conditions – sunrise and sunset offer beautiful golden light; twilight presents rich, “blue hour” tones; nighttime presents the opportunity to use artificial lighting in ways completely different than natural sources. Or you can use a mixture of conditions – silhouetting a bridge against a gorgeous sunset with some lighting that defines certain elements of the bridge that normally would be hidden. All those things play into a good bridge photo. Also important, at least for me, is establishing the context of why the bridge was built. Is it a narrow, deep chasm where there was no opportunity to build an intermediate pier? Is it a large body of water? I want to tell that story the bridge’s purpose, its function, and why the configuration that was constructed is effective and preferred. ASCE News: What do you think translates from your engineering background to photography? Honan: It’s understanding that function, that purpose, of why a bridge exists. Here’s a corollary: I have a longtime passion for railroad photography. One of things I try to when photographing trains is set the context of why does the particular rail line exist. Is it a twisty path at the bottom of a canyon where the only practicable alignment was to follow the course of a river? Is it a long, straight shot across barren plains where there are no obstacles in the way? It’s finding a way to express that context, to visually explain the challenges that faced the engineers who built the lines and led them to the solutions that they chose, that I try to capture in my railroad photography. I take the same approach when I photograph bridges. What is the purpose of this structure? I encourage people to tell that story. ASCE News: Is it something that you will do research on and approach almost academically before you go out? It’s a creative process. There are infinite number of solutions and paths that can lead up to the end result. 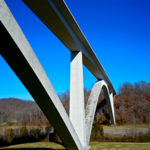 ASCE News: Is there a bridge or photo shoot that was particularly meaningful or memorable? Honan: One of my inspirations for becoming a civil engineer was my father giving me a wide-format book about bridges when I was young. As I turned the pages I came across what must have been a 3-foot-wide panoramic photo of the Forth Bridge in Scotland. This immense bridge immediately appealed to me, and honestly was a crucial moment that inspired me to become a civil engineer. After marrying in the fall of 2012 my wife and I chose to honeymoon in Scotland, and we stayed at a B&B in South Queensferry specifically so I could view the Forth Bridge up close. In person, its incredible dimensions were even more jaw-dropping than images indicated. I ended up submitting a photo of Forth Bridge from that visit for the Bridges Photo Contest, and it was selected for publication in the [ASCE Bridges] Calendar in 2015. That one meaningful photo ties together so many important aspects of my life, completing a full-circle journey from a childhood inspiration for becoming a civil engineer, to visiting the structure while my wife and I celebrated our marriage, and having a photo from that journey be used by ASCE in their signature publication. ASCE News: What is your preferred camera gear? Honan: I have been a Canon shooter ever since I went digital after graduating college. I’m pretty serious about this hobby and currently use a 6D with a bunch of L-series lenses. It’s important to observe that with recent improvements in technology, not everyone needs top-of-the-line photo gear to make high-quality photos; modern point-and-shoot cameras, including cell phones, can produce outstanding images. Without a doubt, though, the most critical piece of equipment is the photographer’s eye: A photo must be seen or imagined before it can be captured. David Honan’s photography can be viewed at his website.